I've been waiting for Alice to start doing things with intent. 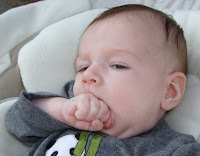 This week, she discovered her fists with her mouth. She can almost fit her entire fist into her mouth. She will even try to fit both fists in at the same time....silly girl!